LOVE BEING A NONNY! : It's Raining It's Snowing And Look Who's Four Months Old! It's Raining It's Snowing And Look Who's Four Months Old! It's a rainy, snowy, cold day here in North Carolina. After an 85 degree day a week ago, that's a tough one. But, two people within an hour this morning had a different outlook on this weather. At the Y this morning I saw a UPS man that works out every morning. I said "It's not a good week for a UPS man." I replied "It's suppose to rain every day but one this week." "Well, we'll just dance in the rain." Then, an older man came into the office to pay his bill. I asked him how he liked this snow and cold. He said "We don't mess with God's work." And they are good examples to me. We don't mess with God's work. But Jesus, will you bring on the sunshine? 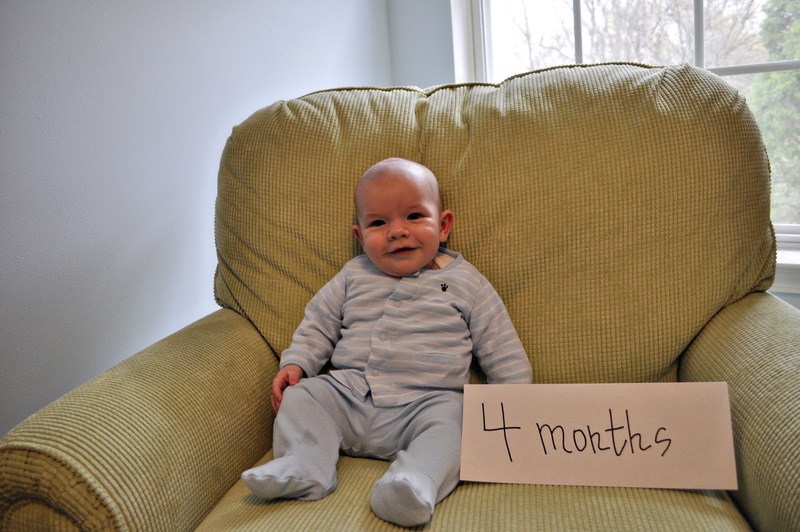 Oh, and look who's four months old today! As a fellow North Carolinian who is a bit tired of the suddenly cool, damp weather I'll just go with the wonderful quote, "We'll just dance in the rain." What a great way to look at it. Love your new header, by the way! It is down right COLD here!! I'm already missing the warm weather we just had a few days ago!! Can't believe the little one is already 4 months old! He is sooo CUTE!!! Blessings and hugs to you my NC friend. Look at that sweet little smile. OMG! That baby looks like Michael!!! Can't believe that your little cutie is 4 months old already. Look at that sweet smile! I love your new header too. Looks great! I'm with you, I'm ready for the warm weather to come back. I do love a rainy day when I can be inside working in the house. Have a nice week. Enjoy dancing in the rain this week, because we are in for lots of rain. Love & blessings from NC! Absolutely HATED driving to work in the snow mix! Bleh! Ready for WARM! This weather certainly is crazy, but if you want the rainbow, you have to put up with the rain! Can't believe Baby B is 4 months old....how adorable!! SO great to see you this past weekend! See ya in a few months for the big day!!!! What a sweet smile! We are on spring break this week, so you know it's cold in northwest Indiana. Just one year it would be nice to have spring and not winter for spring break. Yes God, please bring on the sunshine!! And that baby boy is sooooo cute. I just want to reach in your photo and pick him up and give him some kisses!! I bet you do that alot! !